She calls me "Mama Leisha": Dress Up And A Makeup Tip! Dress Up And A Makeup Tip! 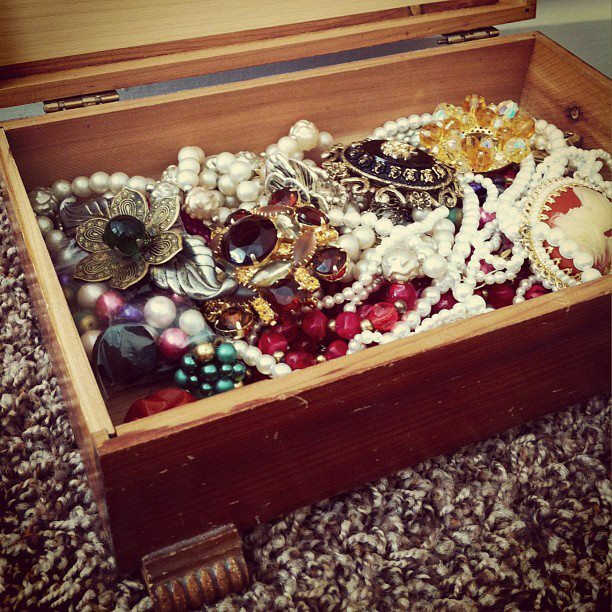 And, I would get to play dress up with the old costume jewelry in her cedar box. I loved that box--the smoothness of the lid beneath my hand, the sweet and slightly woodsy smell of it, the satisfying snap the lid made when the box closed. I loved the jewelry contained inside. Strands of pearls and cameo brooches. Colorful, beaded, "old lady" clip-on earrings. Gold lockets on chains and rings missing rhinestones. I never hesitated to adorn myself with everything in the box! I inherited the beloved box when my dear grandma passed away. It was the only thing I wanted. Monetarily, it's not worth much. But to me and my sentimental heart, it's priceless. Whenever I start to miss my grandma, or yearn to hear the sound of her laughter, or wish I could hug her again, I pull out my box and smell the inside. I close my eyes and breathe in the cedar wood and the old perfume. It smells like her. It smells like childhood memories. Surely, it delights my heart beyond measure to see that my daughter also relishes "the art of the dress up!" She has a passion for makeup, jewelry, and nailpolish, and as much as it terrifies the jeebies out of my husband, I adore it. We have periodic "spa days"--complete with manis and pedis. She has a large box full of princess gowns, tutus, and crowns, that she loves to play with. If she asks me to wear one of the crowns, I'm much obliged! Last week, she wandered into the bathroom while I was doing my own makeup. Bangles graced her pencil-like wrists and pearls hung around her neck. She was wearing a fluffy pink dress and was carrying a purse underneath her arm. Her pretty little face was done up in purple eyeshadow and rosy blush--"play" makeup from her Hello Kitty cosmetic case. She watched me a moment, then asked, "Do you need any help with that?" I smiled and said, "No, Lil. I think I got it. But...I see you've done your makeup like a pro! I HAVE to ask...what is your best makeup tip, dahling?" 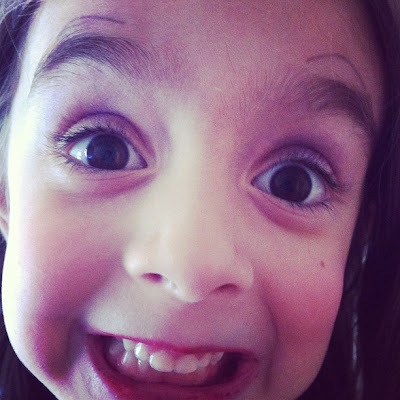 She thought about my question for a moment, then replied, "You can't forget to draw on more eyebrows. Maybe with a pen? That is important!" I LOVE YOU TOO, LADY!!!! HA HA! So glad you enjoyed this post as much as I enjoyed writing it! You made me miss my grandma too. Both of them. Love you! And I love, LOVE Lilly's double brows. hahahaha! 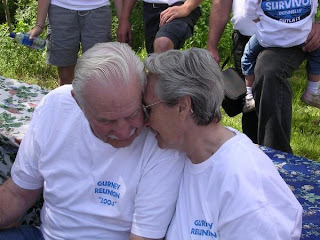 Grandmas are mighty special, and I miss mine all the time. I love you, pretty mama! She is the sweetest! Wanting to help her Mom with makeup. Wonder where they get their ideas. Thanks so much, Claudia! And thank you for commenting. It's always really good to hear from you. I hope you're well! Ahhh, this entry had me from crying to laughing! Hahaha. That last picture is hilarious! She'll love that when she's older, to look back on! So funny! I was the same way when my grandmother passed -- all I wanted was this silly little opossum doorholder cushion that kept the door propped open. It was worth nothing. It was, like, 60 years old at the time she passed. But I had all these crazy memories of growing up and my grandma and I singing to the darn thing! It warms my heart to see my son play with it now. LINDSAY!!! HEY!!! How are you, baby doll?! Thank you so much for your wonderful comment. I was crying and laughing as I was writing this! HA HA! Thank you for sharing your sweet memories of your grandmother too. Opossum doorholder cushion!!!! HA HA!!! That is so fantastic. I love it! Thanks for warming my heart! Hello there my sweet friend! I remember frantically looking around Gardener Village for one of your nani's fantastic earrings! Gosh, you and I have had good times! HA HA! Thanks for always commenting, it warms my heart. I look forward to hearing from you, as it's a highlight of my day! I LOVE YOU!!!!!! This was so sweet! Made me think of my grandma and even my mom! My kids are going to miss out on these kind of memories. My mom has been gone for a couple years now. 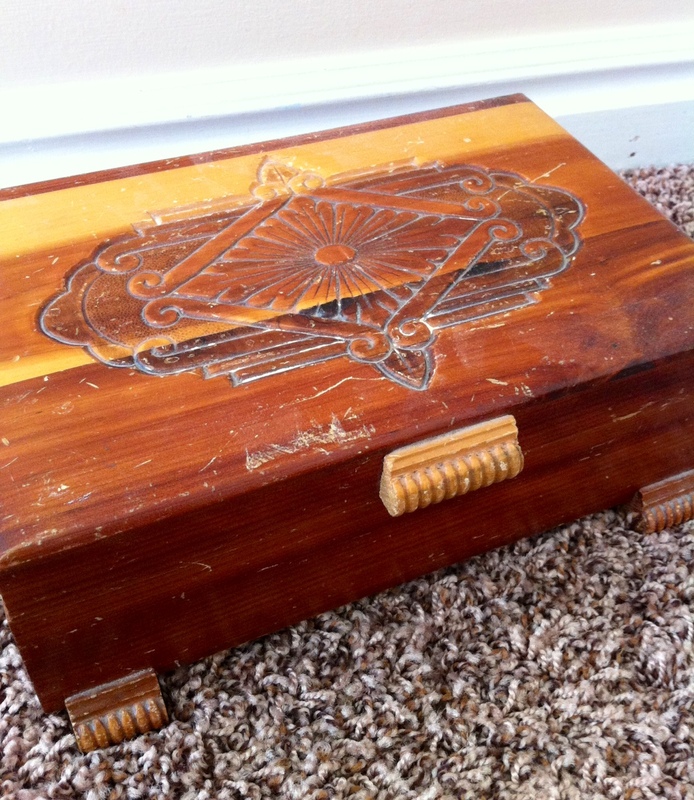 It's funny how something like a jewelry box can bring back such old memories! Thanks for sharing! Thanks for popping by, EmmaK! I'm always grateful for the follow. I visited "Mommy Has A Headache" and it's adorable. Thanks for the comment. CRAZYX4!! I am not an Idaho hater, I promise! HA HA HA! Thanks for your beautiful comment. I hope you are having a lovely weekend! Oh my heck!!! Lilly!!! She is cracking me up! I love your sweet grandma and I am so happy you have something so special to you to help you remember her. Love you! CAMILLE!!!!! HOW ARE YOU? I LOVE YOU, WOMAN! What a treasure. I really miss my grandmother (she practically raised me) Your daughter is beautiful and funny. I remember watching my grandma get all dolled up and her teaching me about fashion… she was something else. following you from the blog hop. What a lovely comment, Maya D! Thank you so much! I appreciate you stopping by, following, and commenting. It sounds like your grandma was a wonderful lady! Aloha! I found your blog through the Aloha Friday Blog Hop! Feel free to visit my blog, and don't be a stranger to start following! Thanks a whole bunch for stopping by, Emma! Looking forward to visiting your blog and reading about you! Glad I found you through the blog hop! Cute blog, I can't wait to read more! I am a new follower, great blog hop! If you get a chance feel free to stop by and check out my current giveaway! I am giving away a huge Valentine's Day Gift basket with all kinds of good stuff. I hope you have a great weekend! Chelsee! You are lovely! I'm so glad you found my blog and that you decided to follow along. That makes my day! I'm always grateful for the support. Hope you are having a nice weekend! XO! P.S. Visited your cute blog and returned the follow! That jewelry box is priceless! Love, love, love this post. And I love playing dress up with my kids too :) It's always a magical time for us. Aw, thanks a bunch for your kind comment, Jessica! You are very sweet. I appreciate you paying me a visit! HELLO SUGAR AUNTS!!! ha ha! You seem darling! Thanks a whole bunch for stopping by my blog, and for following too. I will be returning the follow. Lots of love from this Utah mama! HI! I'm a new follower from the Aloha Blog Hop! Hi Katie! It's nice to "meet" you. Thank you for paying me a visit! I appreciate the follow so much! Hope you are enjoying your weekend. XOXO! Oh goodness how very sweet! 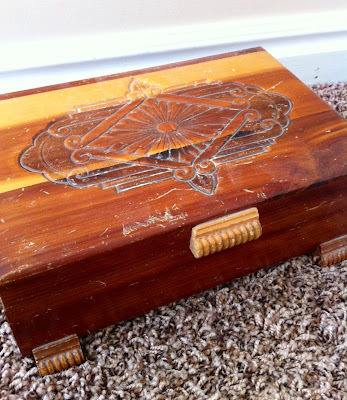 My mom has a similar cedar box filled with "treasures," and my big girls still love this part so much when we visit. Hi Nancy! Thanks a million billion for stopping by my blog, for taking the time to follow, and for leaving such a nice comment. I'm grateful! I'll be sure to pop by your blog and visit you as well. Thanks for being so sweet! LOL, only person I've ever seen w/four brows, and she still looks cute. ;) I have my grandma's sewing machine, and it has that kind of sentimental value to me. I wish I had her button box...just a tin box that was FULL of buttons and she'd let me sort and count them. Oooh, I wish I had her button box too! HA HA! That sounds delightful--a tin full of buttons! Thank you for your comment, "Mail4Rosey!" I hope you know I always look forward to hearing from you. Take care! XO!! Hahaha! I love her makeup tip! I'll have to remember that when I'm doing my makeup! :) I am a new follower from the GFC Blog hop! HA HA! Hi Aaliyah! You are sweetheart! Thank you so much for stopping by my blog and for following me. Makes my day! I'm glad you enjoyed the post. You could totally rock four eyebrows! HA HA! I'll come visit you too! Hello dearest Carole! Thanks a whole bunch for the follow. I will be sure to follow back. Best wishes and have a good week! Valentine Card Holder and 25 Shmacks! A Hop, A Hop! I'm Cohosting A Hop! I Don't Need Thor's Hammer!